The Nobody’s Cats Foundation is a 501(c)3 non-profit organization that promotes the adoption of Trap Neuter Return (TNR) as the preferred strategy for humanely stabilizing and reducing free-roaming domestic feline populations in 15 south-central Pennsylvania counties (Adams, Cumberland, Dauphin, Franklin, Fulton, Huntingdon, Juniata, Lancaster, Lebanon, Mifflin, Northumberland, Perry, Schuylkill, Snyder, and York). This approach prevents suffering among the cats, protects public health, reduces stress on wildlife, and enables communities to redirect desperately needed resources elsewhere. Through our various strategies, including our high-quality, professionally staffed dedicated surgery clinic, we hope to help the regional community manage and reduce our region's population of free-roaming cats in a humane and sustainable way. Whether you love or loath domestic cats, you have a stake in our collective success. 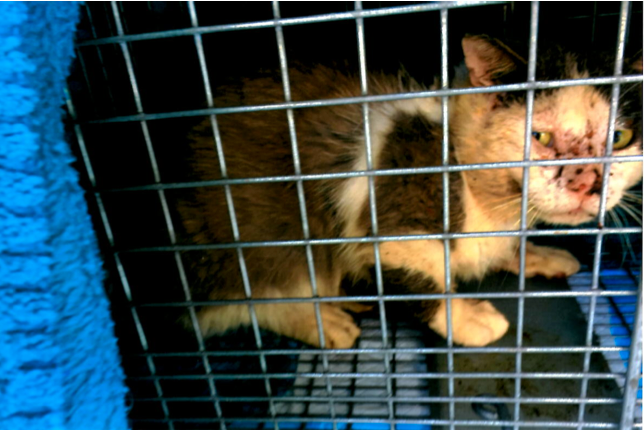 Like many males, this cat struggled because of his biological imperative, not a lifestyle choice. Domestic cats reach reproductive maturity around four months of age, and for community cats in unmanaged colonies, that constitutes a harsh introduction to adulthood. Driven to mate, males can roam two-to-three-square-mile territories in search of fertile females, risking life and limb. Threats abound, from automotive vehicles to wild and domestic canines and humans bent on cruelty. Competition for females is intense. Fights are common. Not everyone wins. 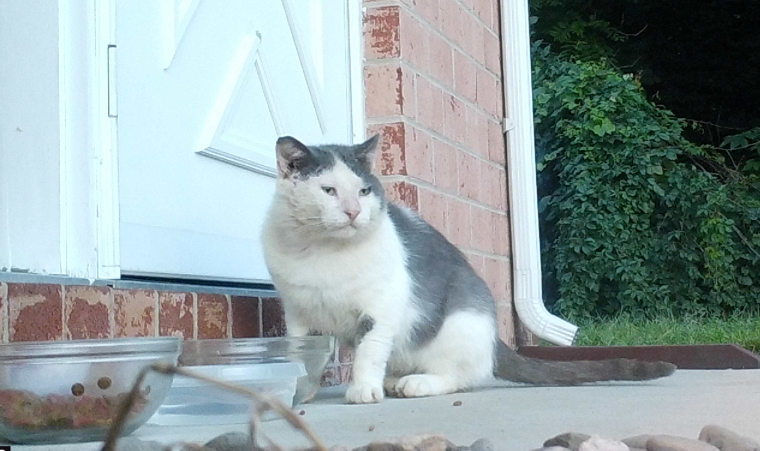 But for this male, life changed when a local advocate stepped up this past summer and began a TNR project in his Shippensburg neighborhood. She trapped him in June, and it was clear he needed all the help he could get. Dirty. Undernourished. Scratched from fighting. And suffering from a polyp near his left nostril that compromised his breathing. His care began with the usual clinic services -- neuter, rabies and distemper vaccines, Revolution for parasites, and ear tip -- but it didn't end there. After his neuter, Dr. L removed the polyp and tech Siri provided a Convenia injection, a long-acting antibiotic, to aid in his recovery. He returned to his outdoor home a few days later and the "after" results say it all! Before TNR. Struggling to survive, and failing. After TNR. Robust, healthy, able to live a decent natural life. A medical technician at Geisinger Holy Spirit Hospital in Camp Hill, Karen Davis volunteers her time and professional skills in our surgery suite twice a month. Karen scrubs surgical tools and wraps surgical packs while monitoring post-operative status for our patients. 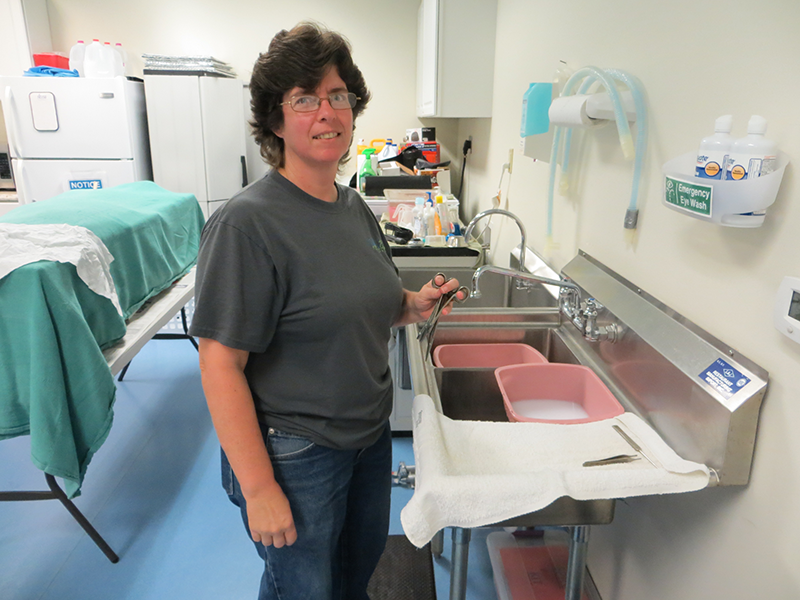 Her professional skills as a medical technician and attention to detail couple with her love of animals to benefit the community cats in our care. "It's great to be part of such a wonderful team with a common goal," she says. "I believe in TNR and the impact it is making in communities and I want to help make a difference." Karen lives in rural Etters, northern York County, with her dog Kermit, cat Reggie, and guinea pig Sheldon. We're grateful that she is willing to share spare time at the clinic, when she could be engaging in her hobbies of gardening, kayaking, hiking, or reading. Do you have professional skills as a medical technician, nurse, or other healthcare professional? You can support our veterinary staff too! These kinds of volunteers make it possible for our staff to be more efficient and help us provide the best possible care to our feline patients. For every new client who files their taxes with H&R Block or Block Advisors, $20 will be donated to The Nobody's Cats Foundation. Just bring the form linked below to your H&R Block advisor. Congratulations to our 2018 Marley Award winners! Melanie Briggs of Fairfield, Wendy Ulrich of Highspire and Kendra Daub of Hershey. Wendy and Kendra received their awards during our annual open house on November 10. 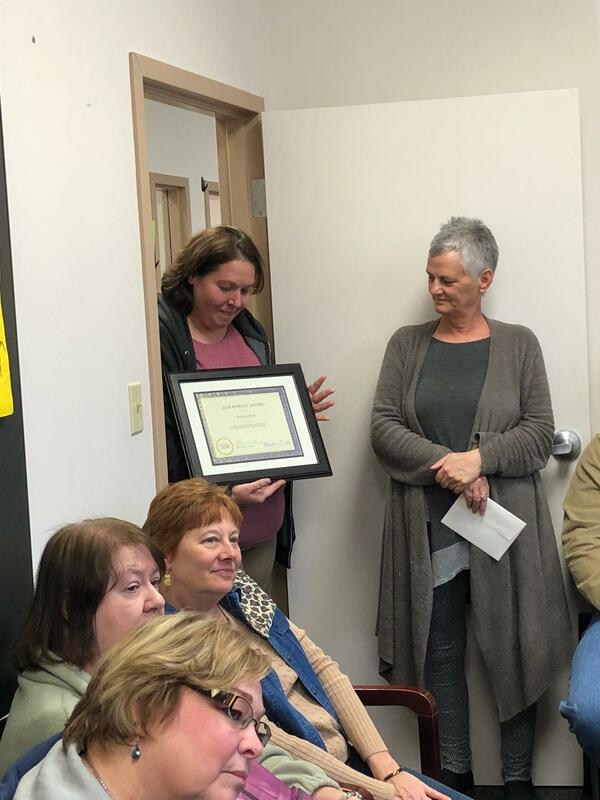 Wendy, who received two nominations, began her TNR efforts in 2000 by volunteering to help a local advocate with managing various community cat colonies in the area. Since then, she has assumed responsibility for numerous trapping projects and is personally responsible for the TNR of almost 300 cats! 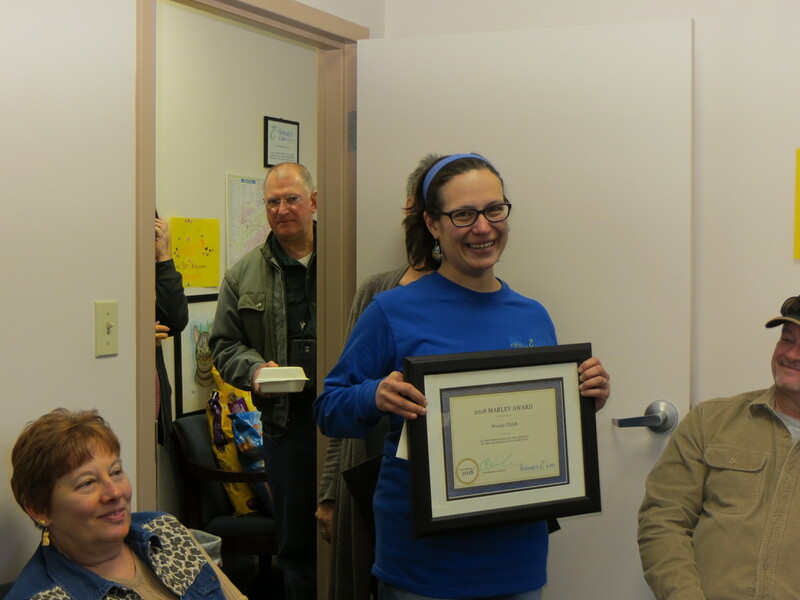 Kendra, nominated by Debra Farrington, operations manager for the Derry Township Community Cats initiative. She has championed challenging TNR projects such as those of large size or in underserved communities. A tireless TNR advocate, Daub also volunteers for Operation Paws for Homes (OPH), managing its Operation Cats and Kittens program. Although she could not attend, Melanie's achievement was celebrated by Dr. Lisa Wolkind, her nominator, talked about Melanie's service as a core volunteer for the county-wide program, and her reputation as a problem solver who has provided significant time and energy to supporting all aspects of the TNR initiative. Another inspiring group of advocates for TNR in our region! A&A Village Treasures, 53 Chambersburg Street, Gettysburg:, Monday, Tuesday, Thursday, Friday, and Saturday 10 am to 6 pm and Sunday 10 am to 5 pm. East Side Auto Sales, 1746 York Road, Gettysburg, Monday through Friday 9 am to 7 pm and Saturday 9 am to 2 pm. Chaparral Tavern, 6878 Anthony Highway, Waynesboro (near Quincy); Sunday through Saturday, from 9 am to 9 pm. Wolf's Furniture, 480 Gateway Avenue, Chambersburg (Customer Service Area); Monday through Friday from 11 am to 8 pm, Saturday from 10 am to 8 pm, and Sunday from 12 noon to 5 pm. Groomer Training Center, 16 East Penn Avenue, Cleona; call 717-507-6440 to arrange drop-off time or use drop-off box on front porch. Sunday's Mill Company, 901 Old Rossville Road, Lewisberry; Monday through Friday from 10 am to 6 pm or Saturday from 8 am to 2 pm. Businesses are encouraged to become part of the food drive network for quarterly drives held in March, June, September, and December. Donation sites are needed throughout the 15 counties of south central Pennsylvania (Adams, Cumberland, Dauphin, Franklin, Fulton, Huntingdon, Juniata, Lancaster, Lebanon, Mifflin, Northumberland, Perry, Schuylkill, Snyder, and York), Food is distributed locally via foundation volunteers and supporters and all promotion and support materials are provided. Supplies are needed for the spay/neuter clinic, colony caretaker services, and other activities. Donations can be dropped off at the foundation facility, 3909 Hartzdale Drive, Suite 905, Camp Hill (Lower Allen Township) on Tuesday through Thursday from 10 am to 2 pm or Saturday from 12 noon to 4 pm.